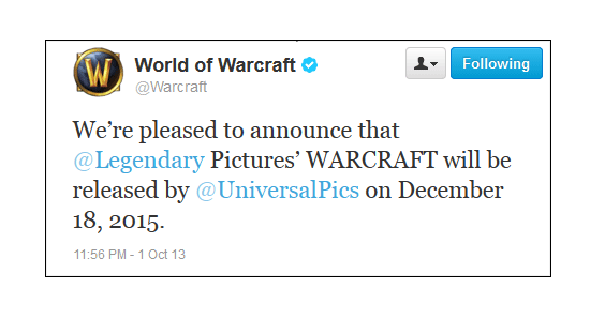 Warcraft movie has got a release date! Recently we have written about the rumor that Colin Farrell and Paula Patton will perform the main roles in the film based on the Warcraft universe, and finally now we want to inform when Warcraft movie will be released. Thus, we have got to know the Warcraft film release date thanks to Blizzard company, the developer and the publisher of Warcraft game series, which has said today via its Twitter account that Warcraft film release date is scheduled for December 18, 2015. Let us recall that the shooting of this masterwork, that is not the first one in the history of world cinema, based on the popular video games, will start in January 2014 under the guidance of very experienced and well-known American filmmaker Duncan Jones. "And with Warcraft, I actually get to create a world and there's not that many filmmakers who get the chance to start from scratch and build something that big. I know how lucky I am and I am so excited to do it." The Warcraft film is believed to have a budget that exceeds $100 million. What do you think about this? Are you waiting for this movies release? Your comments you can leave at the bottom of the page.